Being Mrs M! | Life after the big day! Life after the big day! I have been eyeing up those awesome cakes completely encased in chocolate fingers for a little while, so when it was a friend’s birthday the other week I couldn’t pass up the opportunity to have a go at one myself! Once the cakes are baked, turn them out onto a wire rack and leave to cool a little. Spread your chocolate buttercream over the base cake and sandwich the two cakes together. Put the cake onto a serving plate. Spread the rest of the chocolate buttercream over the top and sides of the cake using a spatula to smooth it over. Wipe any excess buttercream off the plate with a warm wet cloth turning the plate as you go. Now you just need to decorate. Begin by sticking the chocolate fingers around the outside, pressing firmly in the middle of each chocolate finger so it sticks properly. The trick is to let the bottom of the chocolate finger rest on the plate and the middle to stick to the cake. 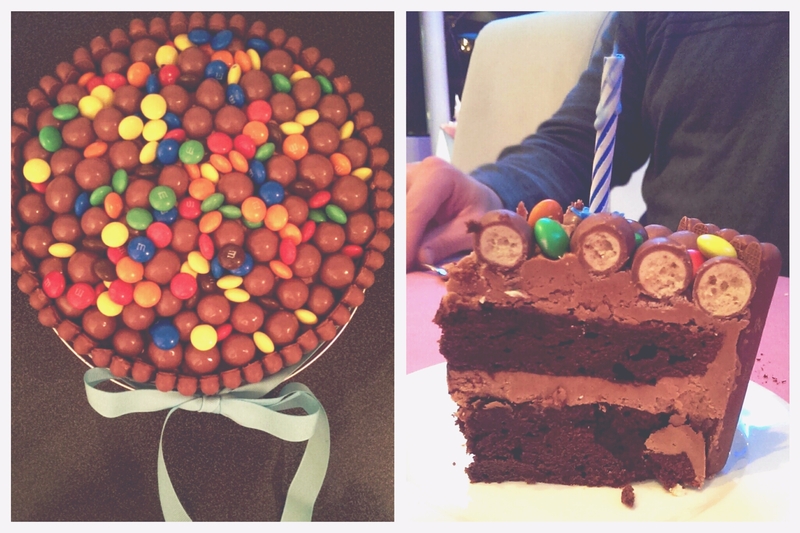 Lastly scatter the chosen topping sweets over the top of the cake and pile them up until you’re happy. As I sat in front of the mirror this morning, trying to dry my hair, a tear fell from my eyes. I had been nominated for a #nomakeupselfie! A slightly melodramatic reaction to the recent social media cancer awareness trend you might say, but let me explain…. 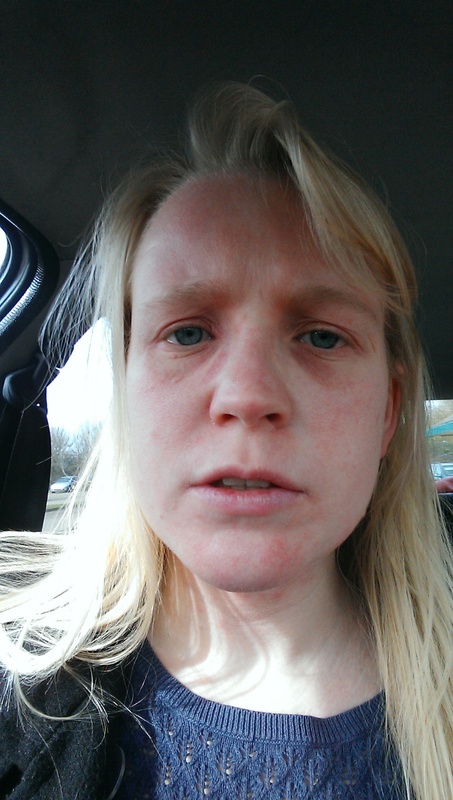 I have had all over eczema for as long as I can remember (and then some!) and have gone through varying degrees of severity. I have learned to live with it on the whole but the one thing that is guaranteed to get me down is a flare up on my face. So imagine my joy when recently my eczema decided to take up a permanent residency on my face! Every morning for the last few months I have woken up with a dry, blotchy and sometimes even swollen face. Not the best start to your morning – especially when you are not a morning person, and I am NOT a morning person! I then spend the next hour trying to make the best of a bad situation, but sadly all I can do though is wash my face and then cake it in moisturiser – make up every day would make it ten times worse! So I just pull my fringe forward, get out my big geeky glasses and put on a brave face. Inside I want to curl up and hide away. Inside my eczema disgusts me. There is nothing worse (in my eyes) than the sight of dry flaky, red blotchy, sore skin. So if I can’t stand the sight of it, why on earth would I make other people have to look at it?! I may go to work every day without any make up but there is no way I will go out in the evenings or at weekends without covering it up. And you will never catch me being photographed without make-up on. NEVER. So you can imagine how I felt when my facebook nomination appeared on my phone! I was mortified. Why on earth would a friend, knowing how much I stress about my skin, ask me to do this? I wanted to scream. But that was not fair on my friend, she hadn’t nominated me to upset me she just wanted the support of her best friends and I should be feeling honoured that she included me in that group. As I sat on my bed devastated at the sight of my skin, wishing the ground would just swallow me up I realised things had gone too far. No longer is my eczema just causing me pain, it is now consuming me. There have been too many nights out missed because I was worried about what other people would think of my red face. (Only the other night I hid in the bedroom while our best friends came over to sign house documents! I should’ve been down in the lounge celebrating with them, toasting their fabulous news, they are our best friends, but instead I hid away in the dark). Too many Skype conversations to my mum with me hiding behind a scarf. Too often is my amazing hubby having to listen to me scream and shout because nothing I do will cover up my ghastly eczema. From now on I am going to try my hardest to stop being so self conscious. To start listening to the hubby when he tells me I’m pretty, instead of brushing his compliments aside. To enjoy time with friends no matter what my skin is looking like. It’s not going to be easy, and I know there will be plenty of hiccups along the way, but I need to overcome this not just for me but for my future children. How do I expect to raise happy and confident children if I don’t practice what I preach! But this selfie is not just for Cancer awareness this is for all those out there who are dreading that nomination. Those of you with a skin condition that makes you want to hide away. There are so many people out there with skin like mine, and a lot of people with skin much, much worse. This is for you. Please know that this is the hardest picture I have ever had to share. That as I write this I am shaking, terrified of pressing that Publish button. I am not looking for pity or sympathy, just support. I love to bake cakes, but due to the wedding planning I kind of let this fall by the wayside. But not any longer, no sir-y! I am getting back to baking and this weekend saw me return with a little bit of a bang. Now I know they are not quite Lola’s or Hummingbird cupcakes BUT never the less they are the best novelty cupcakes I have made, and I may have even done a little happy jig (and squealed with delight) when I had finished them!! 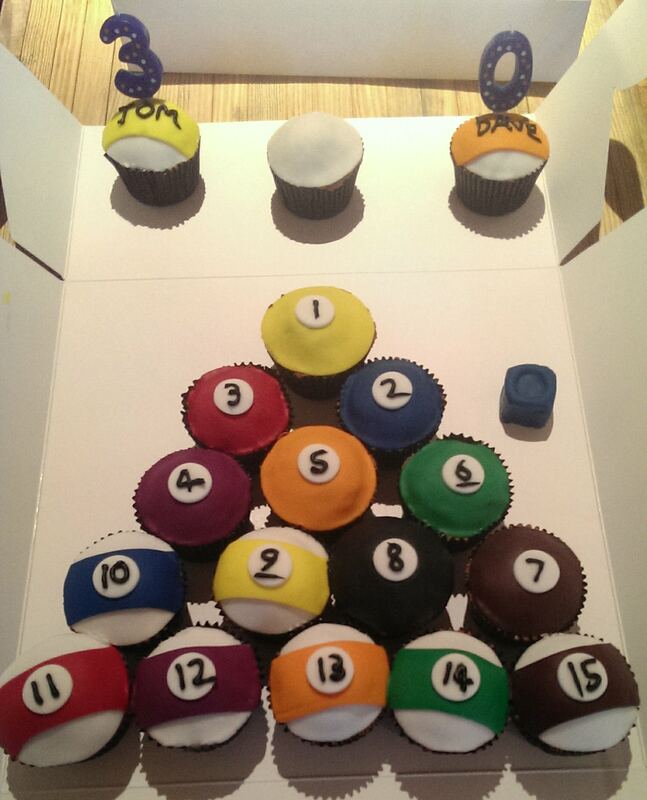 These American Pool novelty cupcakes were to celebrate Mr M & his best friend’s big 3-0 (they love snooker, but I thought snooker balls would’ve been a bit boring!) and the reaction I got from our friends was the best feeling in the world. They all really loved them, and genuinely seemed to be impressed by them. So this has spurred me on to keep up the baking and I will try to share all future baking creations all with everyone (well maybe not the bad ones!!! 😉 ). So watch this space………. As well as this blog, I also write for a new wedding blog called Show Me The Pretty – you should go check it out! Last week to celebrate the big V-day I made some V-day inspired garland and a heart wreath to share with the Show me the Pretty readers. And do you know what, it was so, so easy to make! the garland is just a load of little pom-poms (two different sizes) made with my new pom-p0m maker (you know the one Kirstie Allsopp got given in her Christmas craft show!). then they were tied to a long piece of wool et voilà you have yourself a pom-pom garland! 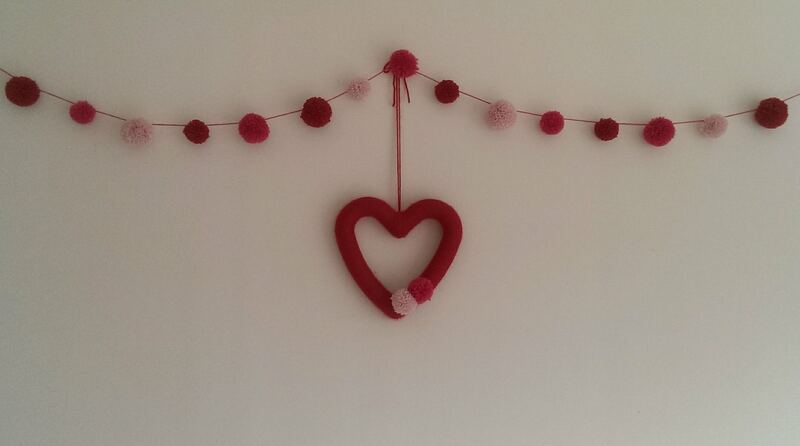 All you need is a heart shaped piece of polystyrene (I got mine from Hobbycraft) and some wool in your chosen colour. Then you take the wool and wrap it around the shape until completely covered. this may take a couple of goes and the corner pieces can be tricky, but the key is to wrap as much wool around as possible and then you can slide the wool around to shift it into the corners. Now you just add any decoration you want to it, here I have tied a couple of the spare pom-poms from the garland onto the bottom edge, but you could add buttons, or flowers, or whatever you want really! See, not that hard at all really, just be careful not to get your ball of wool into a giant knot….. 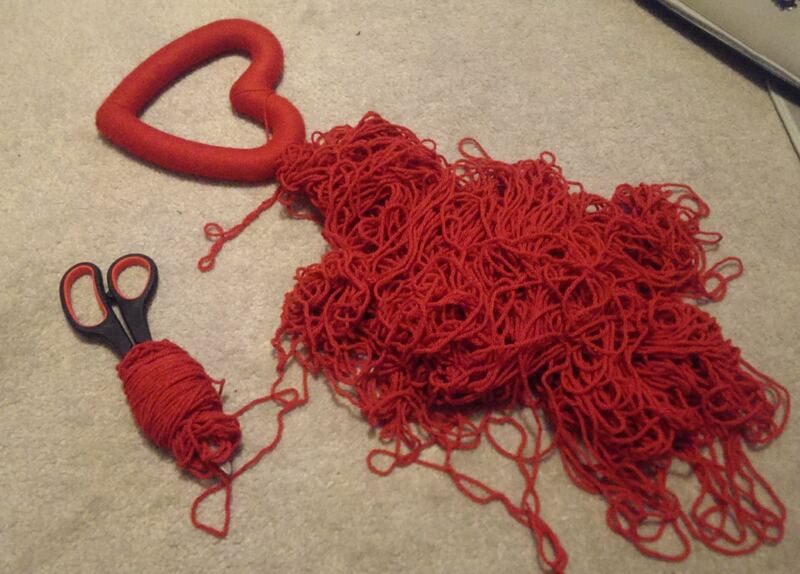 Unraveling that took me far too long!! Tonight (today!) I want to tell you about my lovely friend Nicola Evans. 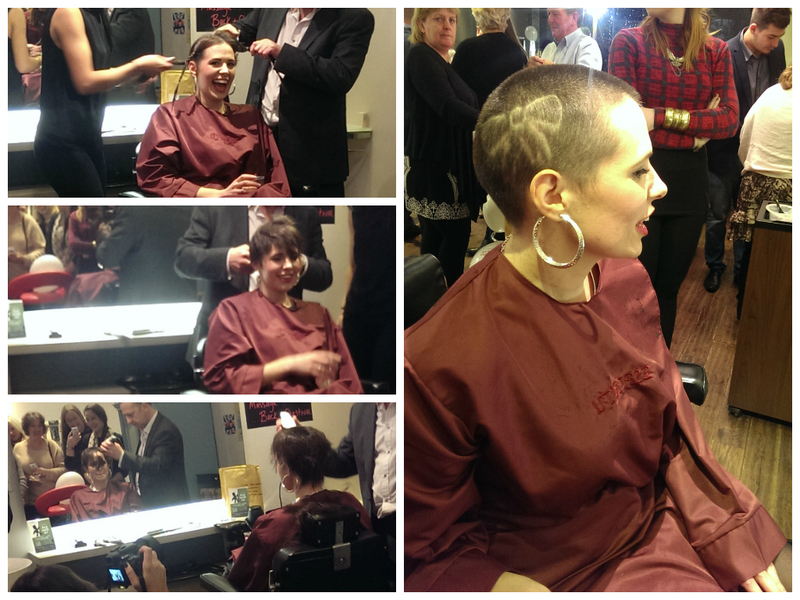 On Tuesday night Nic did something amazing….she raised over £3,000 for a charity very close to her heart. Nic has a 4cm Cavernoma in her brain, a Cavernoma is cluster of blood vessels that look like a raspberry, which can grow and leak causing many neurological disorders. Sadly she has now suffered from 6 strokes, some loss of vision and a number of hospital stays due to her Cavernoma (who she has affectionately named Freddie! ), and has decided enough is enough. So on the 4th March Nic will have neurosurgery to have Freddie evicted once and for all! Nic wanted to give something back to the people who have provided her with so much support, so she decided to shave her head to raise money! 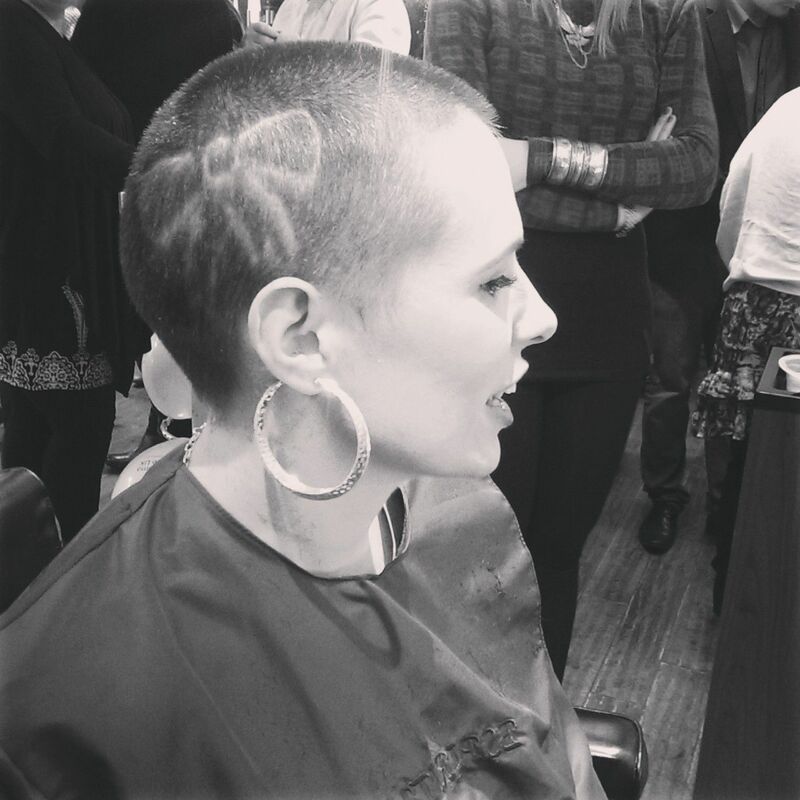 Yup, you heard that right….shave her head! Well if Jessie J can do it……..! So last night Espiritu Salon and Spa opened their doors after hours to host a night of pampering, nibbles and wine, with the culmination being the big shave! All the lovely staff gave up their time for free and all the money raised from the treatments went directly to the charity. There was reflexology, Reiki, Indian head massages, jewellery reading, hand massages, head/neck/should massages, hair treats and for the boys wet shaves and male manicures. Obviously I opted to have my hair chalked! I mean, who wouldn’t want colourful hair?! 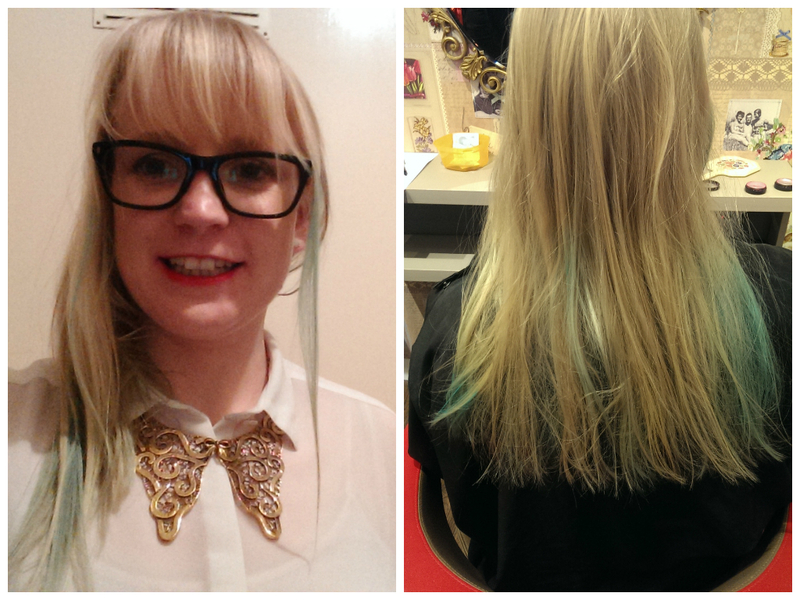 Under the lovely Danny’s guidance I went for blue & yellow chalking in the ends of my hair – the yellow wasn’t the brightest in my hair but the blue, well I loved it! It was lovely to see so many people had come out to show their support for Nic. But it’s not hard to see why, Nic is one the loveliest people you will ever meet. Her smile and laughter is infectious, she is a bubbly chatterbox who, even though she had a room full of people to mingle with, made sure I was not left on my own (her and I are old friends from our days living in an amazing cul-de-sac in Maple Cross – Ladywalk, all my best childhood memories come from there! – so I knew just a small handful of people at the event). But that is just the kind of person she is. 7pm came and as much as Nic tried to avoid it, the chair was calling her. It was time! So with a glass of wine in hand, down she sat to a room full of people staring at her. Her gorgeous long hair was plaited and (with all of us cheering her on) the first cut was made, there was no going back now. The hairdressers cut all the hair short at first, giving us all a glimpse of how easily Nic can pull off a pixie crop! Now came the electric shaver, the cheers roared and the first section was shaved. The room was filled with gasps and cheers (and a few tears). Soon the floor was covered in hair and there she was a smiley shaven head Nic. Oh my goodness she looked stunning! I don’t think there are many people who can carry off this look, but Nic is definitely one of them. Everyone I spoke to had the same response, they just couldn’t believe how much her new do suited her! Last up she had decided to have a pink bow dyed in her hair, so the team set to work shaving the outline of the bow ready for it to be dyed pink! A girl after my own heart! See, I told you she was smiley! Nic, you are one hell of a girl, and an inspiration to us all. You have made everyone so, so very proud to be able to call you their friend. When the 4th March comes round know that we will all be thinking of you, sending you our prayers, thoughts and positive energy, eagerly awaiting to see that smiley face emerge from the other side! If Nic’s story has touched you in anyway then please head over to her Just Giving page and give what you can. One thing on our giant list of to-dos for 2014 is to cook for our friends more. The Mr and I love having friends over but more often that not we will just order takeaway or pick up pre-made nibbles (everyone loves a cheeky duck spring roll!). So this year we vowed to ourselves to learn some new recipes. I eventually stumbled across a yummy Beef Teriyaki dish (here is the BBC recipe) which didn’t take forever to make and seemed to have a reasonable amount of ingredients (we didn’t want to go buying a larder cupboard’s worth of sauces and spices! 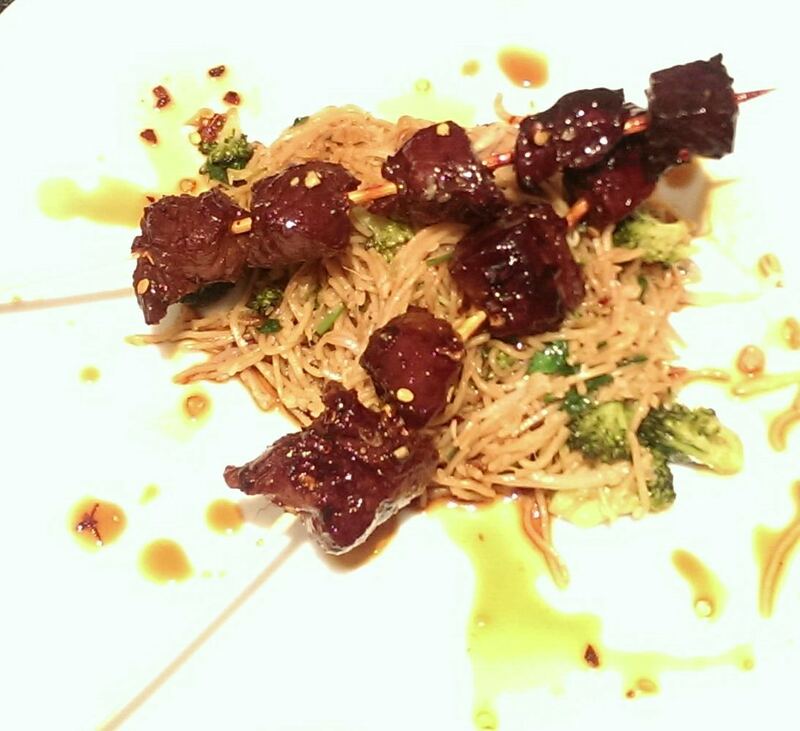 ), they had served it with roasted vegetables but as this wasn’t to my taste I set about finding a yummy noodle recipe (we usually just chuck them in with whatever stir-fry sauce we have picked up at the store!). In the end I took the spicy noodle part of another recipe (this BBC recipe). We followed the recipes pretty much to the letter, the only changes made were that we added some extra veg to the noodles, and multiplied the beef Teriyaki ingredients by 4 (as it was a 1 person recipe). And do you know what….it was pretty darn easy to make and had us thinking about our tendency to use shop bought sauces. What really is the point when this is just as quick?! We did have a few problems with timing and due to that (and cold plates) it cooled pretty quickly. But that aside, the beef was cooked to perfection (thanks to Mr M!) and the whole dish had just the right amount of heat to get those taste buds tingling! We really enjoyed it and I think we had some happy diners! Yay! Oh and an added bonus was that there was a lot of the Teriyaki marinade left over – certainly enough for another meal – Score! 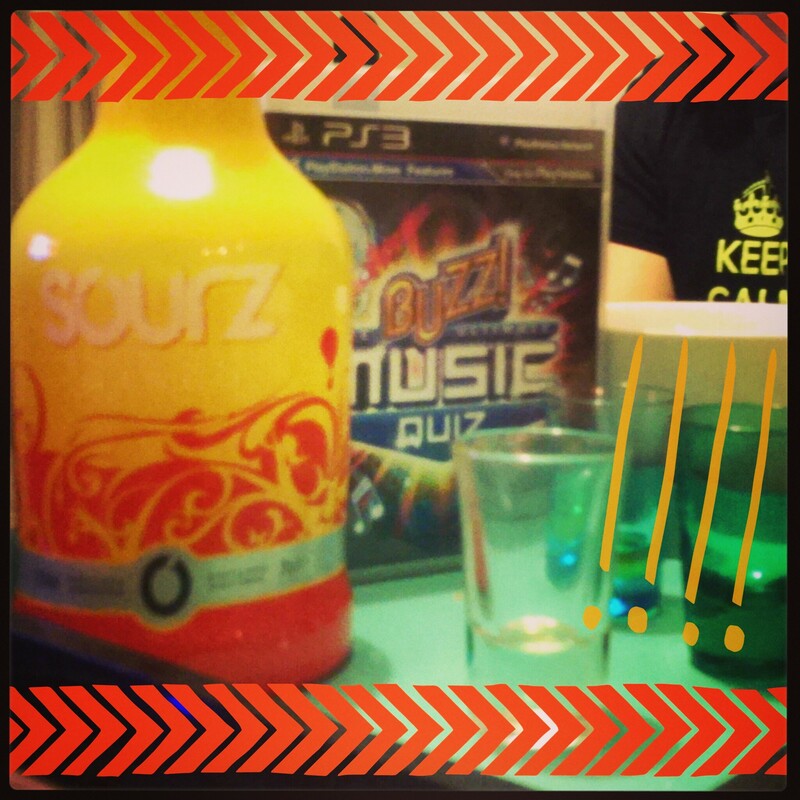 A Mango Sourz shot to the loser of EACH round of Buzz Music Quiz!! 2014 the year of creative juices! 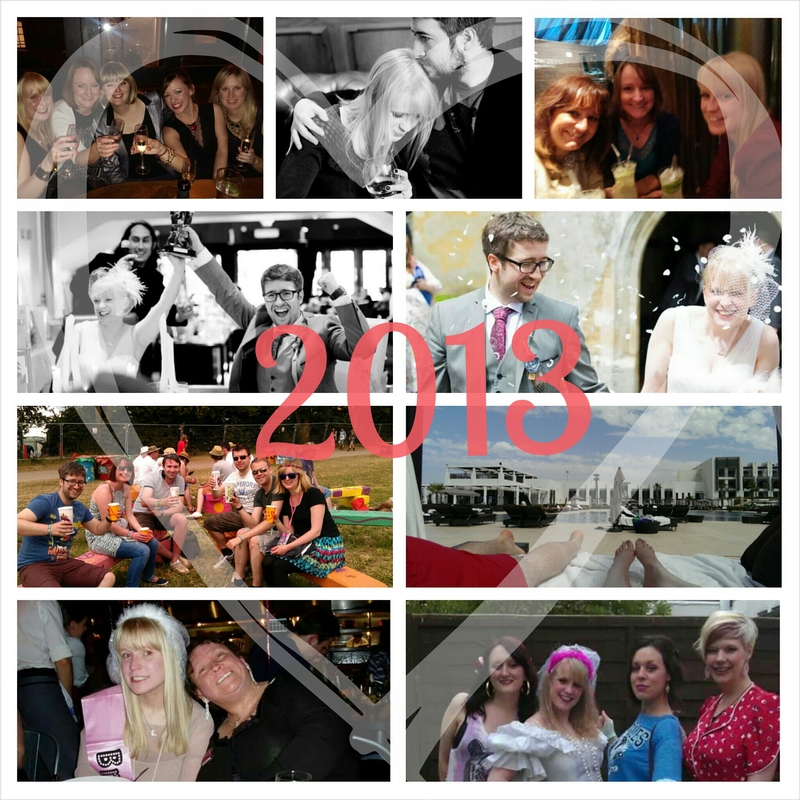 So here we are 2014….. So yes, 2014 has pretty big boots to fill. But all is ok, as 2014 is the year for me to delve even further into my creative side. So for longer than I care to remember I have loved dabbling in a bit of theatre. Then last October I had a random invite to audition for a production, with a small company my friend was involved with. It was all very last minute and I very nearly didn’t go. But for some reason that Sunday morning I got up early and – despite trying to convince myself it wasn’t worth it I wouldn’t be right – I did make my way to Camden (I guess deep down I knew I needed to do this even if I was even more nervous than usual!) As with most auditions I have been to it was random and fun – pretend you’re a cat waking from a sleep anyone? And as with all these auditions I wasn’t sure I had really done my best (I really do have serious self-confidence issues!) BUT lo and behold, it got to the end and I was asked to stay on for the rehearsals and then I was asked if I wanted the part!! I was pretty gobsmacked, but also quite chuffed with myself! 18 months away from any kind of acting and these guys didn’t think I was a waste of their time, in fact they wanted me on board! Utterings of life, love, wedding planning, career building and everything in between. A blog showcasing my bespoke wedding and birthday chalkboards, decorations and signs - perfect for any occasion!